Please help us congratulate Joe Brumage on his “Length of Service” anniversary. Joe joined this great organization on February 27, 1990. 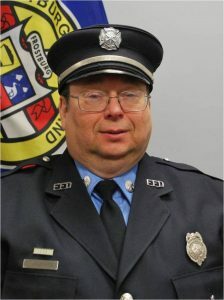 Combined with his previous fire service with the Fairmont, WV VFD, Joe has 33+ years of providing dedicated service. Over the years, Joe has performed thousands of man hours of training and service in an effort to continue the rich traditions of the FFD, including serving eight years as the Department’s President. He is currently serving as the Financial Secretary, Fire-Police Officer and an Assistant Chief with the Allegany County Sheriff’s Office Fire-Police. On behalf of the entire Department and the citizens of Frostburg and surrounding areas, THANK YOU and happy 28th! !